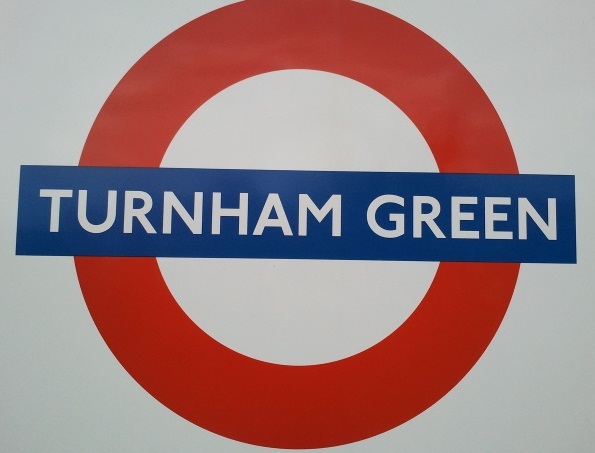 Turnham Green was recorded as Turneham in c.1229 and was once a hamlet on the Great West Road. The name is derived from the Old English turn, 'circular' and hamm, 'a water meadow' -and means literally 'the bend at the river' referring to the nearby River Thames. The Green was first recorded in 1396 where Christ Church now stands. Incidentally, it was here, during the Civil War, that King Charles's troops were checked by the rebel Parliament's Trained Bands of Londoners. The station, which would more accurately be named Bedford Park, was opened as TURNHAM GREEN by the London & South Western Railway on 1 January 1869 and first used by Underground trains on 1 June 1877. The rebuilt station was opened on 3 December 1911.